Prego! Weeks after returning from our Italian flotilla trip last summer, I was still feeling the relaxed atmosphere of the Amalfi Coast. It’s a Mediterranean paradise, with crystal-clear waters, charming hillside towns and cliffside villages, plenty of delicious food and wine, and shopping and stylish swank to spare. 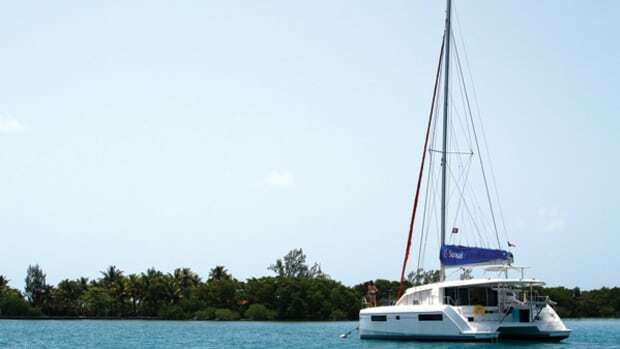 Even better, as we soon discovered after casting off lines, one of the best ways of experiencing all the romance, mystery and history of this area is by charter yacht. 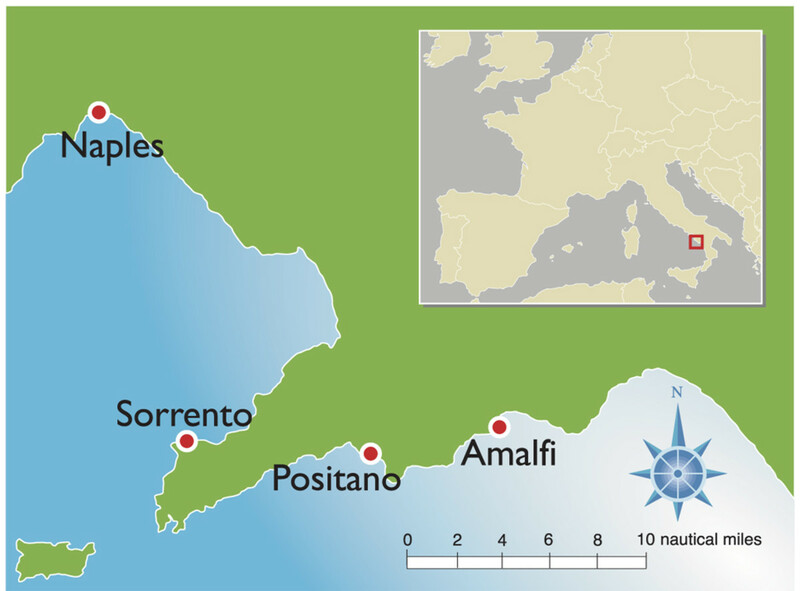 While Italy is a popular Mediterranean sailing destination, an Amalfi Coast/Bay of Naples charter is a bit different. 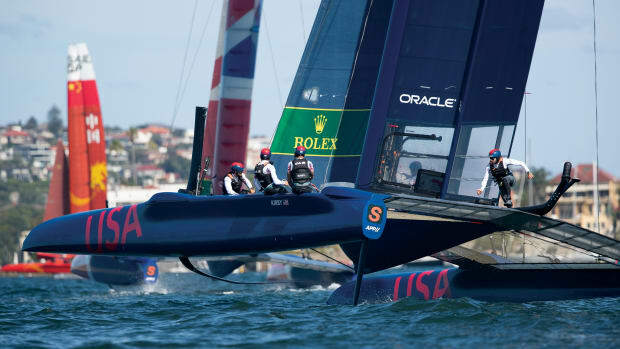 Rather than being known for its sailing, the area is best known for its beauty, history and leisure. 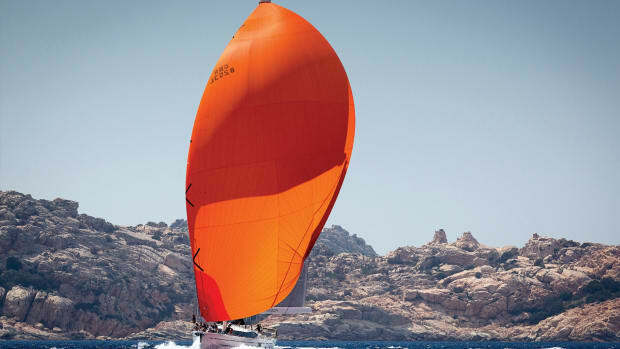 During the summer months, the wind is also not necessarily the best, but the sailing distances between villages are relatively short, and there are all kinds of exciting exploring to do ashore. The views of the coastline from aboard a boat are also truly unforgettable. 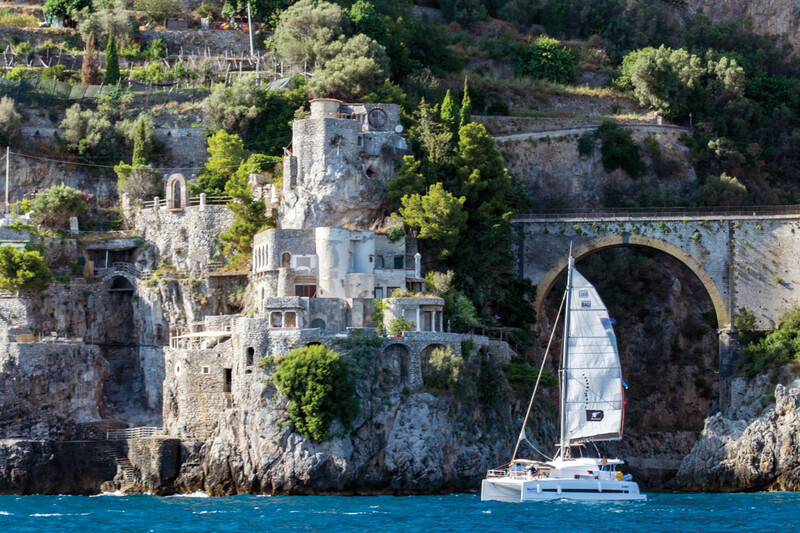 My family and I were able to enjoy this wonderful sailing ground as part of a nine-boat flotilla sailing out of Salerno for a one-week charter around the Amalfi Coast, Capri, and the islands of Ischia and Procida. As fate would have it this turned out to be an ideal itinerary for our small fleet, although it is important to note there are plenty of other islands and coastal villages to see in the Tyrrhenian Sea and Bay of Naples as well. From our home in Texas, we flew into Naples and stayed in an Airbnb in the historic center, where we enjoyed the raw grittiness of the old city. Naples has a modern vibrancy to it that stands in stark contrast to its ancient history. Don’t miss the Napoli Sotterranea (underground city) with its Greek-Roman aqueducts and Roman theater, and the Naples Archeological museum, which contains some of the best-preserved artifacts from Mt. Vesuvius’s devastation of Pompeii. As you are doing so, be sure to also watch out for the boisterous Neapolitans haphazardly riding their scooters through town as you explore their city. From Naples, we took a quick train ride to Sorrento, a seaside resort with spectacular views, great souvenir shopping and seafood. Although not technically part of the Amalfi Coast, many tourists use Sorrento as a hub for a shorebound exploration. Take advantage of its art museums, sample the limoncello, dine in lemon-grove restaurants and shop for the region’s famous woodcrafts or enjoy the bustle of the Piazza Tasso. You could also spend an afternoon strolling the back streets leading down to the Marina Grande where loungers and umbrellas are perched on the breakwaters and colorful beach huts line the backdrop. Two days after that we were off to Salerno, the starting port for our flotilla. Salerno is hard to miss with its famous Castello di Arechi overlooking the humble Italian city and its busy port. Salerno is an authentic Italian town with the realness of Naples and the beauty of Sorrento. Narrow, winding medieval alleyways take you from piazza to piazza, while the seaside promenade (Lungomare Trieste) makes for one of the most beautiful walks in all of Italy. Full of medieval legends the city is also home to a prominent medical school founded in the 9th century and plenty of trendy restaurants and bars, making it the perfect blend of old and new, past and future. Heading out of Salerno with nine boats was a relatively painless process thanks to the organization of NauticEd, StarSail and Sailing Sicily. 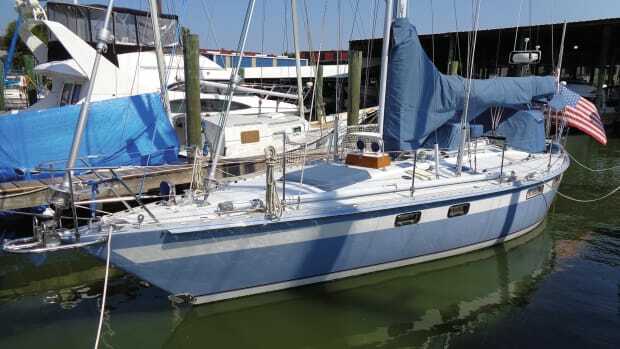 (In all, our flotilla consisted of 63 sailors aboard two catamarans and seven monohulls all eagerly awaiting whatever excitement the coming week might deliver.) After that, our first stop was postcard-perfect Positano, where the approach from seaward was truly amazing as we saw pastel-colored houses clinging onto cliffs descending into the sea. This is the epitome of the Amalfi Coast. With no marina (or even a true bay) and a bit of a swell, many of us were anxious to grab a mooring ball or drop an anchor and head to town to explore. If you are lucky to snag a mooring from Lucibello, take advantage of its water taxi service to and from shore. Positano is known for having one million steps and only one road. However, the workout this vertical town provides is more than worth the effort. In our case, we arrived just in time for the end of the World Cup, and after celebrating the French win we started our ascent into town, where our first stop was at Le Sirenuse, the hotel made famous by Steinbeck, where we stopped for a drink on the balcony with its spectacular views of a stunning sunset. After that, we wandered some more, making frequent stops to gawk at the upscale shops, eventually landing at a lemon-tree-filled restaurant with amazing seafood and an equally amazing house wine. After that came nightcaps at the beach-club bar near the water taxi dock. Clambering back aboard the boat late that night we found we were perfectly positioned to enjoy the music and lights coming from Music on the Rocks, the famous disco on the cliff’s edge. Early next morning we set off on a five-hour sail to Ischia, the “Green Island,” known for its medicinal thermal-water spas. On the way, we also stopped to swim near the Il Gali, an archipelago of little islands known for the mythological sirens who supposedly lived there. The Mediterranean waters here are refreshingly cool. Sailing past the Aragonese Castle, a 15th-century Spanish-built castle on the eastern side of Ischia, we picked up a mooring in Marina Casamicciola in the north. Not surprisingly, we enjoyed Ischia very much. There are numerous thermal pools, spas and beaches all close to the island’s several harbors and all readily accessible. We also hopped aboard a bus and headed for dinner and drinks in Ischia Porta near the castle, where we sampled the local rabbit dishes and drink. The following morning, several of us took advantage of a later-than-usual departure to relax in the Negombo thermal spa resort a short walk away in the Lacco Ameno area. 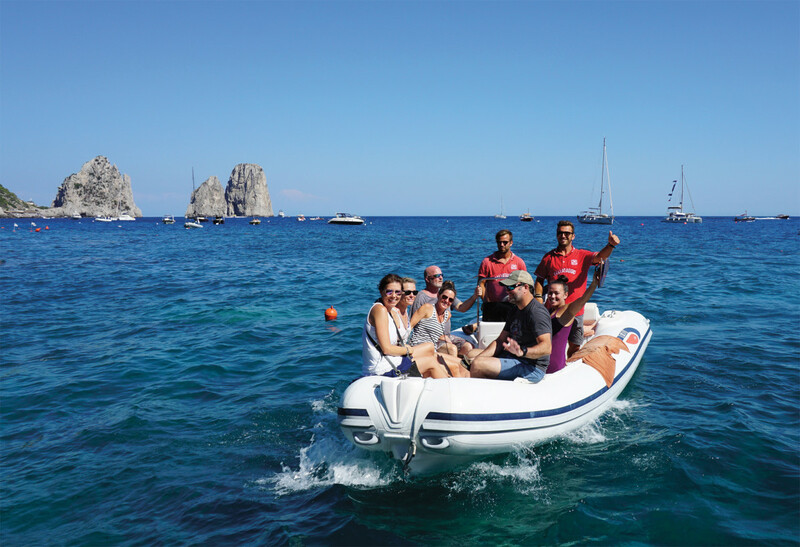 Others headed off to explore the castle or opted for an inland tour of Ischia proper, known for lush vegetation and wineries, where they also hiked toward Mt. Epomeo, the highest mount on the island. Ischia’s neighbor, Procida, is a modest village full of fishermen, history and seafood, and after mooring in Marina Grande, we took off to discover the charm of this easily walkable island, stopping for an aperitif at the Piazza dei Martiti. That done, we strolled toward Terra Murata, the highest point on the island where thick fortress walls overlook remnants of the old medieval town and the Abbey of St. Michael. The true highlight of Procida, however, is the picturesque view of faded pastel-colored homes and tiny fishing boats in Marina Corricella, which we enjoyed while having gelato and prosecco at Chiaro Di Luna. It’s no wonder this area has served as the backdrop to several films. Before leaving the following morning we stopped by Bar Dal Cavaliere to savor the local lingua di Procida, a delicious fluffy, flaky pastry filled with lemon. 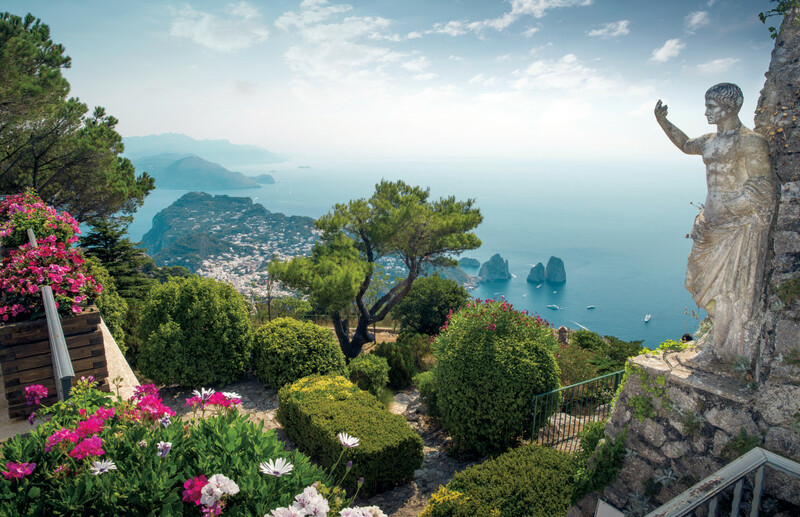 From there, our next stop was Capri, the iconic destination symbolizing affluence, style, celebrity, fashion and glamour. Capri soars into the sky with its dramatic Faraglioni, the iconic rock formations towering out of the depths of the sea. Upon our arrival, we picked up a mooring ball in Marina Piccola, while others in our fleet paid the steep costs and moored on the northern side of Capri in Marina Grande, a short funicular ride away from the main piazza. Ashore, we enjoyed an Aperol Spirtz and people-watched, hoping for a celebrity sighting before setting out to wander the narrow streets overflowing with charming upscale bars and cafes and fashion-elite. Local shops offer handmade sandals ready for you in less than 20 minutes. Restaurants are top-notch and nightlife is abundant. In the very heart of Amalfi, the moorish Duomo is a prominent presence in the main town square, which is in turn surrounded by a maze of paths and streets full of restaurants, markets and souvenir shops. While you’re there, be sure to stop at the Paper Museum. Nearby, the towns of Ravello and Atrani are also popular stops, with Atrani, the smallest town in Southern Italy, serving as Amalfi’s twin sister—a fishing village with a labyrinth of alleys and walkways, ancient medieval buildings and tiny gardens. For our part, we opted to visit Ravello where we were suitably inspired by its artistic flair and famous gardens. After that, it was back to Salerno on the last afternoon. The flotilla sailors gathered left-over provisions and libations and joined for a last hurrah dinner on the bow of our Bali catamaran while cheering the Amalfi Coast and a wonderful sailing vacation. 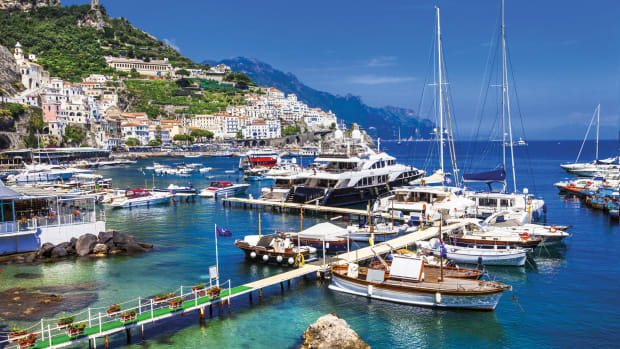 While chartering on the Amalfi Coast does require a bit more organization than some other charter destinations, it is certainly worthwhile.  In high season (end of June through end of August), you need to reserve slips and mooring balls well in advance—and be prepared for the high costs. 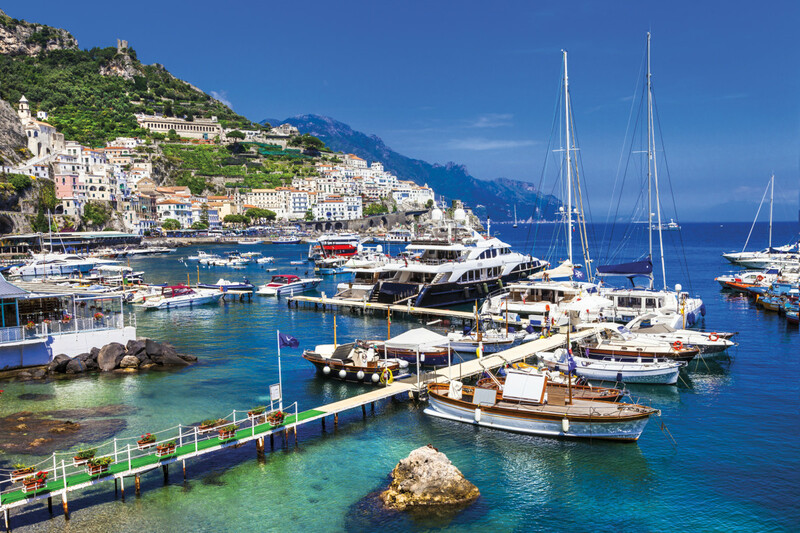 Mooring fees in Capri’s Marina Grande can be up to 300 EUR a night, while in Amalfi, the average monohull paid 200 EUR. 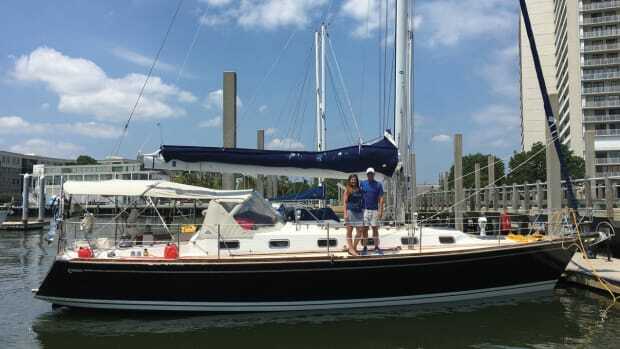 While there are some anchorages and some mooring balls are less expensive, you’ll have to organize how to get ashore. Weather can be hot and the towns crowded during the summer months. Keep in mind that the coastline and area are large. Pick and choose an itinerary you’re comfortable with, but know that you cannot see it all. In addition to the Amalfi Coast and Capri, there are the Phlegraean islands and Pontine islands as well, which we didn’t even attempt to visit. 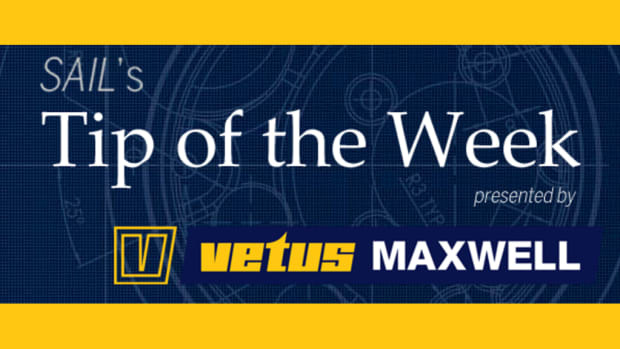 Although we chartered for a week, we’d certainly recommend planning a trip for two weeks if possible. Most importantly, while there is an abundance of things to do and see, heed the Italian motto that epitomizes the coast—La Dolce Far Niente—the sweetness of doing nothing. Sail leisurely, enjoy the numerous grottos, wander back alleys and shopping streets, slowly sip prosecco on the restaurant terrace overlooking the bay, breathe the fresh air, admire the stunning landscape and marvel at the history and architecture. It truly is bellissimo!